Tiramisu is one of my very favourite desserts – every mouthful of this creamy and ever-so-slightly naughty Italian dessert demands yet another. 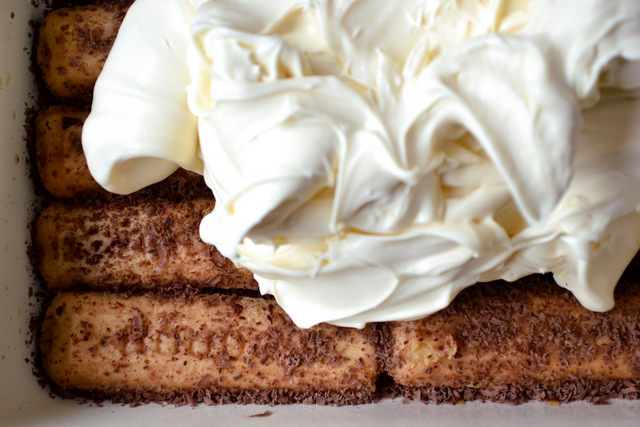 Nothing is left wanting if one’s tiramisu is made according to a good recipe – the coffee and rum soaked sponge fingers give it a feisty flavour and subtle texture, whilst the cream cheese, mascarpone and double cream provide copious richness. In fact, scratch my initial proposition – this is my number one dessert, not even this or any other cheesecake can touch it. For all the perfection that is to be found in this tiramisu recipe, there is one pitfall to avoid which pertains to the soaking of the sponge fingers. One must be careful to merely show them to the coffee, an in and out encounter, for as soon as they remain too long in the liquid they are likely to become unbearably soggy. Shop bought tiramisu possess this somewhat fatal trait and, believe me, it is to be avoided rather like one might attempt to avoid the plague. Don’t worry too much about which dish to use for your tiramisu – the creamy layer can be as thick as you like, but aim for around 1.5-2 inches. However, if you intend to use a particularly deep vessel that isn’t very wide it may be advisable to do two layers of sponge fingers and two layers of cream. Following this advice will enable you to avoid creating an overly rich and creamy dessert. It’s your call – you’ll enjoy the recipe either way. 1. 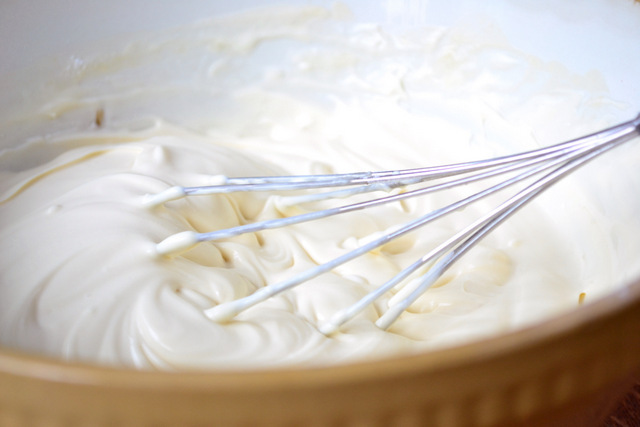 Whisk together the mascarpone cheese, cream cheese, double cream, rum and sugar until it is completely smooth and uniform. 2. Make up your coffee using two heaped teaspoons of coffee granules. Dip each sponge finger in the coffee for no more than 1-2 seconds – layer these on the base of your chosen tiramisu vessel and grate over half of the chocolate. 3. Layer the creamy mixture on top of the sponge fingers and press down until flat and level. Grate over the remaining chocolate and pop in the fridge for an hour, this will allow it to firm up and make it easier to serve. Cost: If one invests in a large bottle of dark rum, an ingredient which can used in many different ways, this tiramisu recipe can be made for an extremely reasonable price. Indeed, assuming that you have made such an investment this entire casserole dish of tiramisu should set you back no more than £3.50 – very frugal if one considers how many it will feed! I am SO making this to take to a friends tomorrow for our New Year’s Eve dinner. The kids can have banoffee pie. This is just for the grown ups!!! I want to make every single recipe you post. I also want to go on a diet. I am hopelessly conflicted. But thank you. Jayze that looks stupidly nice. I love your blog but you always make me feel like a rank amateur when I read your posts! Despite my post xmas diet having technically started I reckon I am gonna have to make this sooner rather than later! Oh man, there goes my post-Christmas diet… Here in the US we don’t have anything called double cream. Do you know, is it the same as heavy cream or whipping cream? Can’t wait to try this recipe! Funny how my daughter was telling me we have some double cream at home and that I should make a tiramisu which I have never made any before. I told her I do not have a recipe (was thinking of searching online later) and then you posted this number 1 dessert of yours! Thank you 🙂 They look super delicious here. Great idea for Holidays. I was just preparing to do it when you post the recipe. I will show you mine when is done. this one is all you need! YUM! Looks delightful, can’t wait to try it. Question, though. Double cream, is that just heavy cream or something else? I don’t think I have heard that term on this side of the pond. I believe it’s heavy cream! 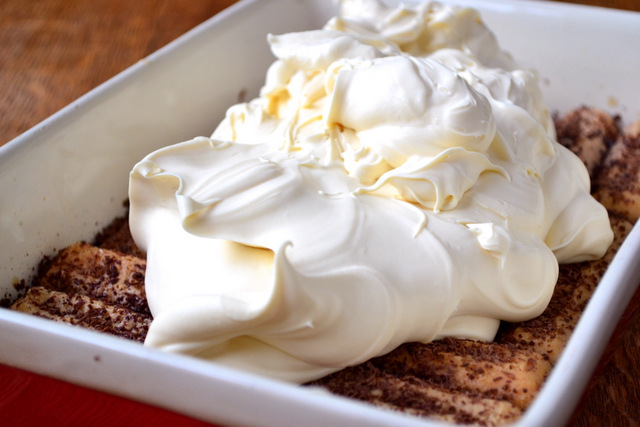 Looks fabulous – I’ve never made tiramisu – but I love it – will try when time allows…Happy New Year!! Oh groan … and I was on a diet! I’ll definitely have to find a way to veganize it. May I ask an additional question about your photography: Where do you snap your photographs? Wherever I go, everywhere in this house seems to be something annoying in the background 😀 Do you use a certain screen or anything to prevent too much beackground stuff? Give it a go – you must! Thanks. I snap them on a small coffee table next to a window :D. No screen – but I do use a light reflector. Tiramisu is one of my all time favourte desserts. Thank you so much for sharing your recipe! 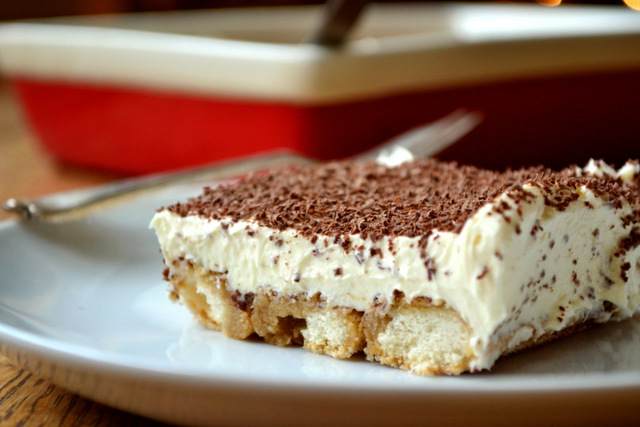 I’ve had tiramisu in the back of my mind for ages… one of these days I’ll get around to making it. So delicious!! Oh do, it;s so simple, Korena! God damned. And my diet starts tomorrow! I have been meaning to make my own tiramisu – thanks for the reminder! Better get on it before my annual new year’s resolution to eat less sweets is set! Happy (almost) new year! Give it a whirl, Amanda! Happy (belated) New Year! This looks extremely delicious. I was just thinking about how much I wanted tiramisu at breakfast time this morning. I insist this dessert will be in heaven. I love it, therefore I don’t want to make it for the sake of ruining a great thing. 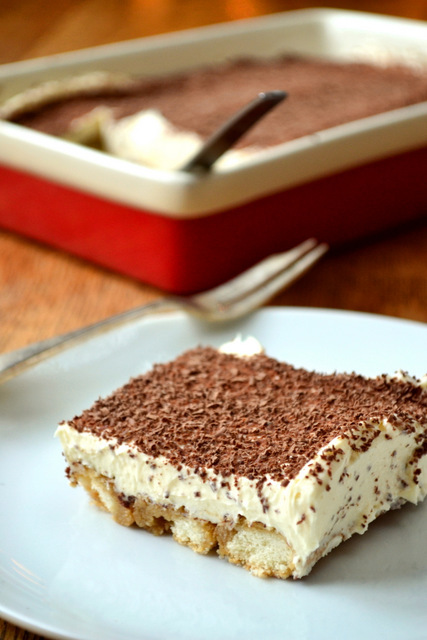 I have never made tiramisu before, but it looks pretty simple – I will have to make it sometime! Thanks for the recipe! Bless you! Happy New Year! Hehe – thanks, Somer! you’ll do it! That is boo! should have loads. Oh definitely… odd present though. Never tried vegemite… sounds gross. I just want to shove my face into that cream in the second photo. Tiramisu is my very favorite indulgence period. Ever. Cheesecake is my 2nd. I haven’t had it in at least 2 years and miss it terribly. I started working on a vegan recipe during the holidays, but it’s not quite there yet….Want to get the cake ladyfingers just right. I’m very particular with high standards to tiramisu since it is only the best dessert EVER and I’ve never liked any recipe but one in my whole life. Mascarpone is just unmatched. Yours looks very good! haha – I did… not really. Make some! you’l get there! Stick with it. thanks so much. Tiramisu is one of my favorite desserts too! This looks glorious, Nick. Bravo! Thanks so much, Daisy! We have so much in common – hah! 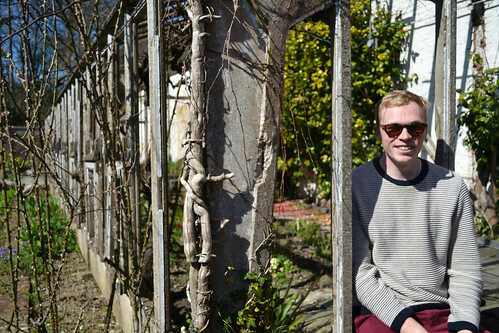 Thanks, Conor – and belatedly to you! Ok. I’ve made it. It’s sitting in the fridge waiting to travel from Kent to Hertfordshire for a New Years eve dinner party. I’ve licked the spoon. Scraped the bowl clean and now seriously can’t wait to eat it. Thanks for a quick and easy dessert. fantastic! I REALLY hope you enjoy it! Indeed – I think it’s done wonders. This is certainly a great recipe though, give it a shot 😀 – Ramsey is overrated :D. Happy New Year. Thanks for so much support! You whip your cream with a whisk? Impressive. no, no, no… well sometimes – this doesn’t need proper whisking! I want to climb into the pictures and just make a piglet of myself. This is scrumptious!!!! £3.50. Really?? Mascarpone, double cream and cream cheese comes to that before adding the biscuits etc!! Oh, yum. The all time favourite. Had sticky toffee pudding for new years on this end, with a naughty dash of ice cream on the side. Amen. mmmmn I love tiramisu but have never made it myself! Thanks for the recipe. I made a tirimusu for Christmas day as my German hubby don’t like Christmas pud (I know! I mean what’s not to like?) Anyhow my version was slightly different – from Irish Chef Darina Allen. No cream or cream cheese- just mascarpone and a separated egg instead plus lots of frantic whisking. Made the day before for maximum alcohol soakage. Absolutely delicious, as yours was I’m sure. Happy New Year! Your way is the authentic way. The one here is not, but still sounds good. Ahha – he doesn’t like Christmas pudding?! Weird. I disagree with egg in tiramisu, but I’m sure it was lovely! This really looks delicious and easy to make but I have very limited resources. I’m hoping you could share us something elegant and delicious with very simple ingredients. I’d like to learn something that I can make for a gift or something. You know how I love desserts! hmm, weird… I’ve never seen an egg in tiramisu! I do like zabaglione… but that’s odd. Looks delicious! I have always used the Tiramisu recipe from the Silver Spoon cookbook but it doesn’t call for any alcohol which I always thought was funny. I’ll have to try your recipe next time! Thanks! Oh it HAS to have alcohol. I think we made tiramisu at the same time last week! Mine was pretty pricey though! I made a huge one (2 layers, 9x13in pan). Instead of rum, I use hazelnut liqueur, tasty as well. To save money, I bought one of those tiny sample bottles, but the whole thing still set me back about US$25. What a coincidence! that’s a nice idea. Oh my God, that’s expensive! Tiramisu is my favorite dessert hands down. This recipe looks so easy, I’ll definitely have to try it out! Love your recipe! I made my own version with peaches and ricotta if you would like to check it out! Thanks for liking “songwriting” and for a mouthwatering look at things that make me wish I wasn’t diabetic. It’s so beautiful–wish I could reach into your blog for a plateful.